on gross soil structure (Lavelle and Spain, 2001; van Vliet and Hendrix, 2003). Methods for studying these faunal groups are mostly size-dependent. The macro-fauna may be sampled as field collections, often by hand sorting, and populations of individuals are usually measured. 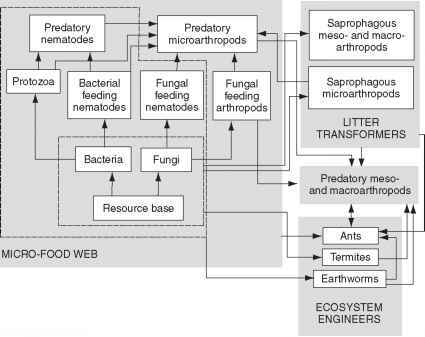 FIGURE 7.2 Organization of the soil food web into three categories—ecosystem engineers, litter transformers, and micro-food webs (after Wardle, 2002, and Lavelle et al., 1995). and protozoans). These three levels operate on different size, spatial, and time scales (Fig. 7.2, Wardle, 2002). The free-living protozoa of litter and soils belong to two phyla, the Sarco-mastigophora and the Ciliophora. 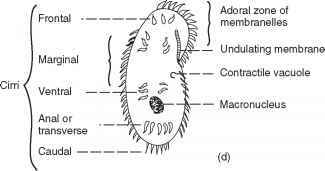 They are considered in four ecological groups: the flagellates, naked amoebae, testacea, and ciliates (Lousier and Bamforth, 1990). A general comparison of body plans is given in Fig. 7.3, showing representatives of the four major types. 1. Flagellates (named for their one or more flagella, or whip-like propulsive organs) are among the more numerous and active of the protozoa. They play a significant role in nutrient turnover, with bacteria as their principal prey items (Zwart and Darbyshire, 1991; Kuikman and Van Veen, 1989). Numbers vary from 102g-1 in desert soils to more than 105g-1 in forest soils (Bamforth, 1980). 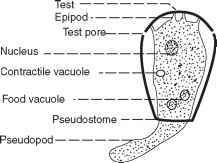 FIGURE 7.3 Morphology of four types of soil Protozoa: (a) flagellate (Bodo); (b) naked amoeba (Naegleria); (c) testacean (Hyalosphenia); (d) ciliate (Oxytricha) (from Lousier and Bamforth, 1990). feeding for the amoebae, as for the larger forms such as Ciliates, is phagotrophic (engulfing), with bacteria, fungi, algae, and other fine particulate organic matter being the majority of the ingested material. They are highly plastic, in terms of their ability to explore very small cavities or pores in soil aggregates and to feed upon bacteria that would otherwise be considered inaccessible to predators (Foster and Dormaar, 1991). 3. Testate amoebae: Compared with the naked amoebae, testate amoebae are often less numerous, except in moist, forested systems. They are more easily enumerated by a range of direct filtration and staining procedures. Lousier and Parkinson (1984) noted a mean annual biomass of 0.07 g dry wt m~2 of aspen woodland soil, much smaller than the average annual mass for bacteria or fungi, 23 and 40 g dry wt m~2, respectively. However, the testacean annual secondary production (new tissue per year) was 21 g dry wt m~2, which they calculated to be essentially the entire average standing crop of the bacteria in that site. 4. Ciliates have unusual life cycles and complex reproductive patterns and tend to be restricted to very moist or seasonally moist habitats. Their numbers are lower than those of other groups, with a general range of 10 to 500 g "1 of litter/soil. 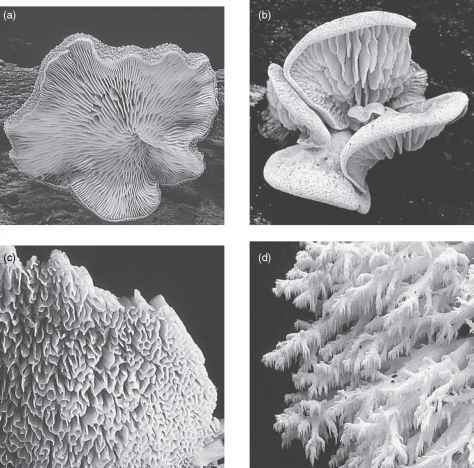 Ciliates can be very active in entering soil cavities and pores and exploiting bacterial food sources (Foissner, 1987). Ciliates, like other protozoa, have resistant or encysted forms and emerge when conditions, such as food availability, are favorable for growth and reproduction. Ciliates, flagellates, and naked and testate amoebae reproduce asexually by fission. The flagellates, naked amoebae, and testacea reproduce by syngamy, or fusion of two cells. For the ciliates, sexual reproduction occurs by conjugation, with the micronucleus undergoing meiosis in two individuals and the two cells joining at the region of the cytostome and exchanging haploid "gametic" nuclei. Each ciliate cell then undergoes fission to produce individuals, which are genetically different from the preconjugant parents (Lousier and Bamforth, 1990).